After weeks and weeks of waiting, first because I was moving and had no mailing address, next because these things take time, I finally got a packet in the mail from the fabulous folks over at Picture This Plus! 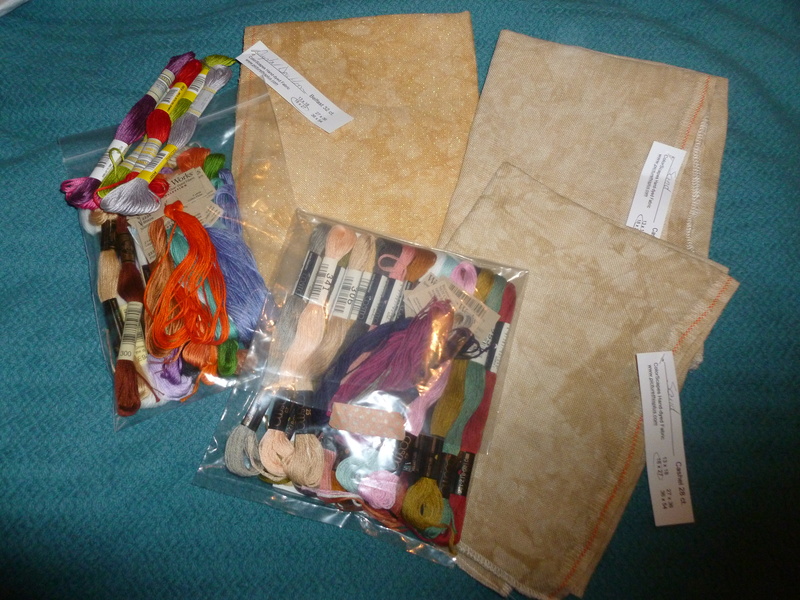 PTP specializes in hand-dyed cross stitch fabric, and they are amazing. Go ahead, pop over there and click through some of the fabric thumbnails. I can wait. Fun, amiright? There are so many colors I would love to buy, but I have no idea what I would do with them. I got three cuts of fabric today, one in Crystal Doubloon and two in Sand. The Doubloon is for the Pumpkins’ Once Upon a Time sampler, I think as 32-count Belfast linen (I would check the tag, but there a beast asleep in my lap). The two cuts in Sand (28-count Cashel) are for the secret mystery gift I’m making for a friend and for a pattern I drew up myself last November. The gold fabric is the doubloon, and the khaki is the sand. In addition, I also got the floss for Once Upon a Time and Clouds Factory’s Magical Creatures sampler. The Once Upon a Time floss is a mix of Weeks Dye Works and Cosmo. This will be the first time I’ve used hand-dyed floss; to get the full effect, you have to use a different technique. We’ll see how it goes (I mean, it will be fine, just a little slow). I’ve used Cosmo before and much prefer it to DMC, but I haven’t decided if I like it enough to keep paying extra for it. On a good day, the price doubles. I’m using DMC and Sullivan’s for Magical Creatures, DMC so I can compare it to eh Cosmo in my other projects and Sullivan’s because one of my floss sources recommended it over the DMC. It costs about the same as the DMC. Only thing I’m missing is the fabric for Magical Creatures. I actually ordered two different cuts of linen, but I haven’t decided which one I’m going to use. One should be here in a few days, but the other probably won’t turn up for two weeks or so. Eh, there are plenty of other projects to work on until it gets here.